If each preceding ACC signaled a milestone advance—exteriorization, livingness, beingness—what unfolded on the 5th American ACC was just as significant. It concerned universes, or as L. Ron Hubbard explained, “It is better, far better for the individual to concentrate upon his own universe, than to concentrate upon the mest universe. But this, in itself, is not the final answer. A balance is achieved in the three universes and certainty upon those universes.” The creator of a universe is its “god” and he who enters another’s universe is subject to its postulates and laws, a predicament affecting most preclears. These discoveries yielded an arsenal of technology: Advanced Course Procedure, to accomplish the primary auditing goal of the preclear changing his mind; SOP 8‑D, including a technique to separate interwoven universes, and Viewpoint Straightwire and Be, Do, Have Straightwire to enable a preclear to tolerate any viewpoints in any universe. Throughout, Mr. Hubbard stressed fundamentals, providing descriptions of time, space, engrams, facsimiles and the static, with an entire lecture on how to audit Self Analysis. Here, then, are the keys to unlocking the secrets of universes and making one’s postulates stick. With the successful completion of the first four Advanced Clinical Courses, wins were pouring in from the field in an ever-widening stream. A partially deaf preclear regained his hearing after just a few auditing commands. A woman unable to walk from a severely injured foot, with a doctor predicting a six-week recovery, instead sought out an auditor and two days later strode forth for a new hairdo. Then there was the store manageress incapacitated by migraine, chills, fever and a host of other ailments, about to shut up shop when a customer arrived. Forty minutes later, she had reopened and was on the phone lining up business—it just so happened her customer was an ACC graduate. So when, on March 29, 1954, L. Ron Hubbard arrived at 616 North 3rd Street, Phoenix, to begin delivery of the 5th American Advanced Clinical Course, a select group of auditors waited in anticipation. Their expectations would soon be fully realized. Because if each previous ACC had been marked with yet another milestone advance—exteriorization, livingness, beingness—what was about to unfold was every bit as significant. Specifically, the subject of Universes. 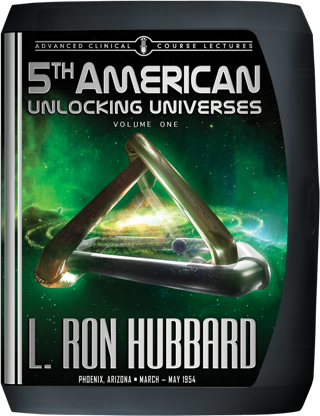 As those auditors on the 5th ACC soon discovered, what L. Ron Hubbard was imparting to them represented a major breakthrough in their ability to crack cases. For as he revealed, the creator of a universe is the “god” of that universe, and one who enters another’s universe is subject to its postulates and laws. And that is exactly where most of their preclears were to be found—in the universes of others. Viewpoint Straightwire and Be, Do, Have Straightwire—processes to enable a preclear to tolerate any and all viewpoints, in any universe. Space—when auditing an arduous case that refuses to get well, the pc’s space has to be solved before his postulates can be addressed. With the spectacular results from these technical advances, expansion—so as to bring it to others—became a key priority. Thus, despite his rigorous lecture schedule and the white-hot pace of research, Mr. Hubbard drove dissemination into a high roar, with books distributed by the thousands, field activities springing up from Auckland to Boston and word of mouth increasing by the day from the countless stories of lives changed for the better. And if that was the word on the organizational front, he was also going directly to the broad public. For despite the intensive schedule, and in between lectures, it was during the 5th ACC that Mr. Hubbard delivered a series of 15-minute radio broadcasts on the fundamentals of Scientology. Case in point: his perennial classic, “Is It Possible to Be Happy?” originally aired as one of that memorable series of talks. Today it appears as the first chapter of Scientology: A New Slant on Life—a testament to the enduring effects of L. Ron Hubbard’s technical developments in setting the future course of dissemination.